McDonald’s fries are believed to be the most delicious of their kind, but have you ever wondered what do they actually contain and why is this delicacy that irresistible? 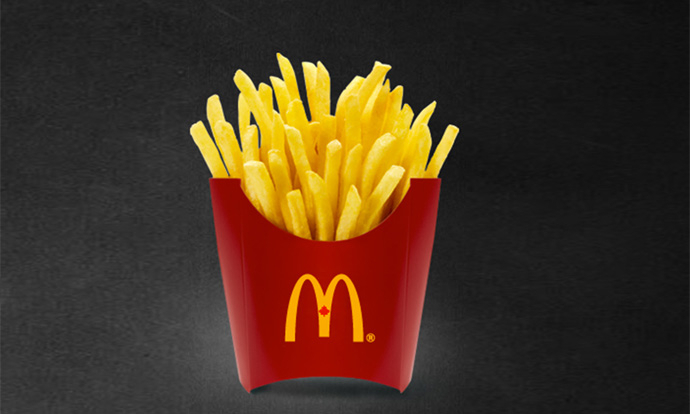 McDonald’s uses Russet Burbank potatoes with nice oval shape and a good combination of starch and sugar. Excess sugar can change the taste and give an aroma of burned food. To avoid this, the company uses a process called bleaching in which they remove the excess sugar. Even after the frying potatoes can get not that nice looking color, because the iron reacts during the process. To avoid anything like this, the producers add sodium pyrophosphate, whose ions stop the reaction of the iron ions, so the potatoes keep their nice color during the whole process. In the past McDonalds used beef tallow to fry their potatoes, but the demands to reduce the saturated fat led to changes and the company started using vegetable oil. The “natural beef flavor” comes from the hydrolized wheat and milk proteins which probably give the distinctive flavor when combined, writes Wired. The fries get two doses of vegetable oil -- one during the frying in the factory, and the second during the preparation in the fast food restaurant. Corn oil and TBHQ additive are being added at this point, and when used in large amounts the additive can cause some serious health problems (in the laboratory experiments on mice, large amounts of this additive caused stomach cancer). McDonalds uses this oil for each fried delicacy, and TBHQ additive acts like an antioxidant for the oil while it is being kept. The use of dextrose known as glucose returns the sweet taste taken during the bleaching. The result is a homogenous outer layer which caramelizes equally. By adding ketchup, your fries get even more sugar. At the very end, before the serving, the fries are well salted. This creates a hedonistic combination of fat, salt and sugar. Scientists Find: Ripe Banana (with dark patches) Combats Abnormal Cells And Cancer! Shocking: Here Are The Harmful Ingredients Found in Commercial Ice Cream !